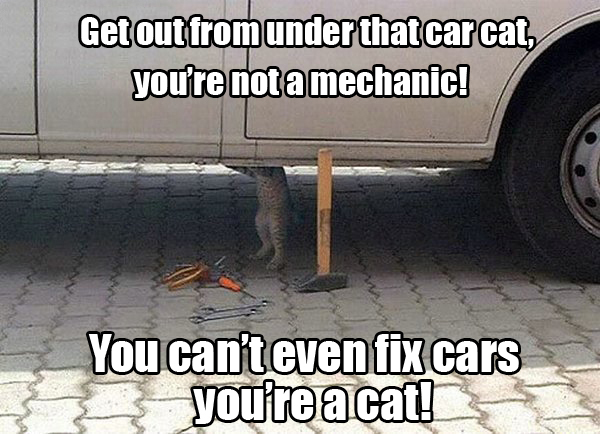 Yeah, we all know cats can only fix trucks. I really want to hate these but I just can't. There is no way for someone to hate caturday. I know it's like no matter how overused they are I still find them funny. Caturday will be here in only 2 hours! Those are the pictures posted on caturday. That site wouldn't exist without Caturday. Caturday started it all as a simple dedication to posting cats on a certain website every Saturday. It doesn't matter where the cat pictures come from, it's ALL an origination from Caturday itself.